To receive notifications about your cameras on your phone or mobile device, you must configure the push notification settings in your Stratocast™ mobile app. Set up your mobile authentication key for your user account. Ensure that you can log on to the Stratocast™ mobile app. Contact your service provider to enable motion detection for the cameras that you want to receive push notifications. Contact your service provider to adjust the sensitivity and threshold settings according to the camera's environment. Push notifications are only accessible for Stratocast™ mobile app end users. Integrators cannot access notifications or configuration settings from the end-user accounts they manage because notifications are configured on the mobile device. 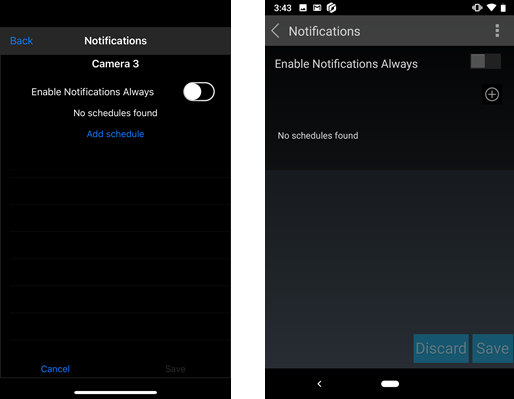 The time it takes to receive a push notification on your mobile device might vary depending on the connection between your device and the mobile service provider, and also your device configuration settings. The time shown in the notification text is when the motion detected event occurred. If the camera is in another time zone, the event time refers to that time zone. 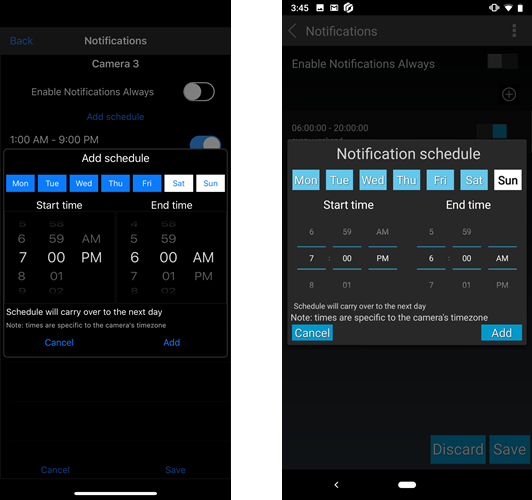 If a camera is replaced by your integrator, the push notification schedule in the mobile application must be setup again. If a user logs off from the Stratocast™ mobile app, push notifications are no longer received. Launch the Stratocast™ mobile app, log on, and then go to the Monitoring page. In the Notifications page, tap a camera to start configuring notifications for that device. By default, the Enable Notifications Always option is disabled for all cameras. Tap Enable Notifications Always or swipe to the right to enable notifications for the selected camera. 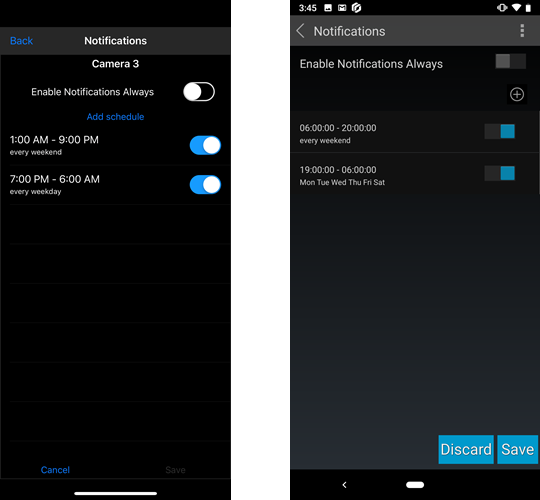 When this option is enabled, push notifications for the selected camera can be received at any time during the Always schedule. To save your changes, tap Save and tap Yes to confirm the change. TIP: You can set one or more notification schedules for your camera. This is useful when you do not want notifications from a camera at all times, such as when you are physically in the same room as the device. In the Notifications page, Tap Add Schedule (iOS) or tap to add a schedule. 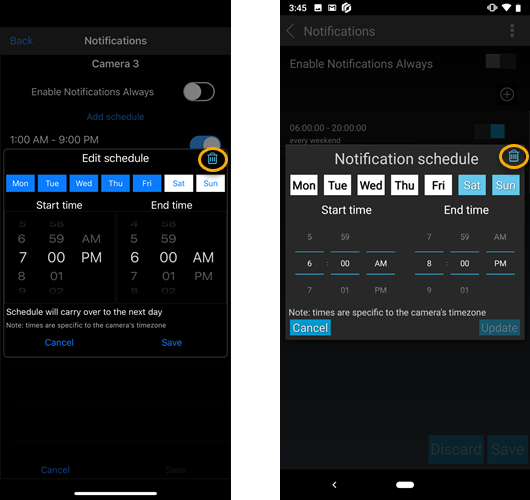 In the Add schedule (iOS) or Notification schedule (Android) dialog box, choose the days of the week that you need, and set the start time and end time of the schedule. Selected days are displayed in blue and unselected days are displayed in white. The times are specific to the time zone of the camera, not your Stratocast™ mobile app or the time zone set in the client account information. Tap Add when you have the schedule set the way you want, and then tap Save. NOTE: If the end time is earlier than the start time, the schedule is processed as an overnight time range. For example, if Monday is selected, with a start time of 9:00 pm and an end time of 6:00 am, motion detected notifications are sent to your mobile devices between 9:00 pm on Monday until 6:00 am on Tuesday morning. On the Notifications page, use the slider controls to enable or disable any of the listed schedules. Tap Save, or tap Discard or Cancel to revert to the previously saved state. (Optional) Modify or delete a schedule. Tap a schedule to modify the selected days or the start time and end time of the schedule. Tap to delete any schedules that you no longer require. You will start to receive the notifications on your mobile device. Notifications continue to be received even if the Stratocast™ mobile app is closed or your device is locked. To view video associated with the motion detected event, tap the notification to open it. The Stratocast™ mobile app opens with the camera already selected and the video queued up to the time of the motion detected event notification.